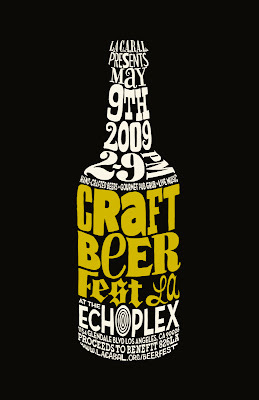 The newly created Los Angeles Craft and Artisanal Beer Appreciation League (LA Cabal) has announced the first annual Craft Beer Fest L.A. on May 9 at the Echoplex. and beer strictly from California craft brewers such as The Bruery, Craftsman, Firestone Walker, Hangar 24, Port Brewing, Lost Abbey, Sierra Nevada, Telegraph and more. Tickets are an extremely reasonable $30, with all beer and food included as well as four bands. Hot Knives' Evan George says the event is meant to foster a craft beer community in L.A. and geared to beer connoisseurs, and will be the first of many events. "It's a bunch of beer geeks forming a non-profit," he explains. LA Cabal sounds like an awesome idea, and was founded by Ben at Pure Luck, Alex Macy, formerly of Red Carpet now of Bottle Rock Downtown, Bob Kunz of Father's Office, Hot Knives and Kevin at Artisanal Ales. Don't get confused: There also Drink.Eat.Play's L.A. Beer Fest going on April 4 and 5 in Culver City -- but the more beer the better, right? Thanks for the heads up, Pat. Beer cupcakes and gelato? Yes! It says you can buy the tickets online but any word where? The Echoplex site doesn't list the event yet. :( Thanks for posting this btw! Stay tuned, Caroline, this is kind of a pre-announcement but I'm sure tickets will be announced soon. Great find. Those are some terrific breweries, and any event with Scoops gelato is a victory. yay, I can't wait for this! this sounds great! Please post when and where to buy tickets?